Dessert trends come + go. Hand pies, cookie butter, cronuts – they’ve all had their moments in the spotlight recently, but those trends tend to fade after time. One dessert that never seems to go out of style? COOKIES! While I know that a lot of people don’t do as much baking in the summer because of the warm temperatures, I’m someone who loves baked goods all year ’round. 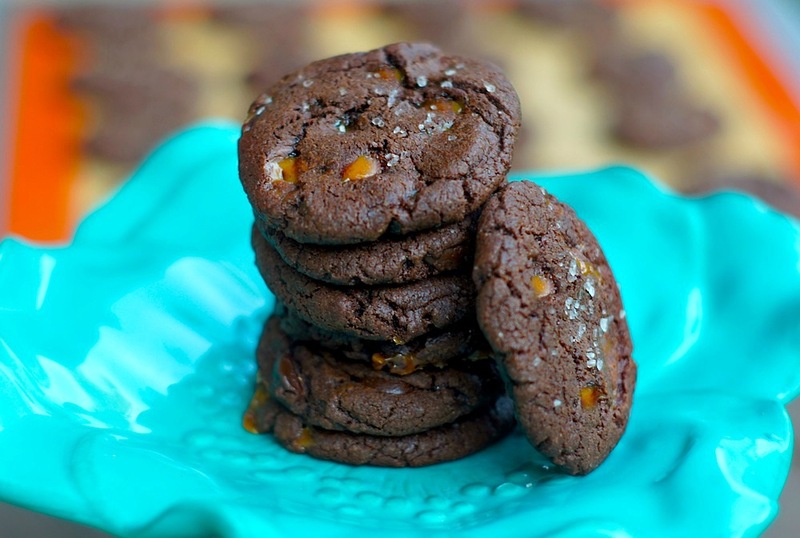 A couple weeks ago, I realized it had been too long since I baked a homemade treat, so I fired up the oven, + decided to try a new-to-me cookie recipe – these Salted Caramel Chocolate Cookies. And y’all, these were SO amazingly tasty. 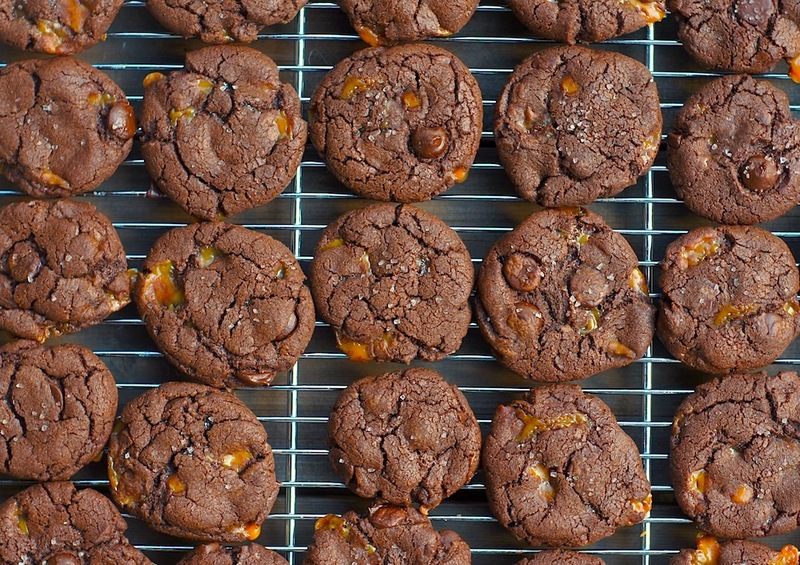 Rich, heavenly, chocolate cookies stuffed with melty chocolate chips + gooey caramel, with a perfect burst of saltiness from sea salt sprinkled on top. Texture-wise, they are SO wonderful – they have a slightly-dense, soft + chewy interior, with a brownie-like crackly exterior. Between the fantastic combination of flavors + textures, these cookies were truly perfection. My husband said they were his favorite cookies that I’ve ever made, and I’m inclined to agree with him. 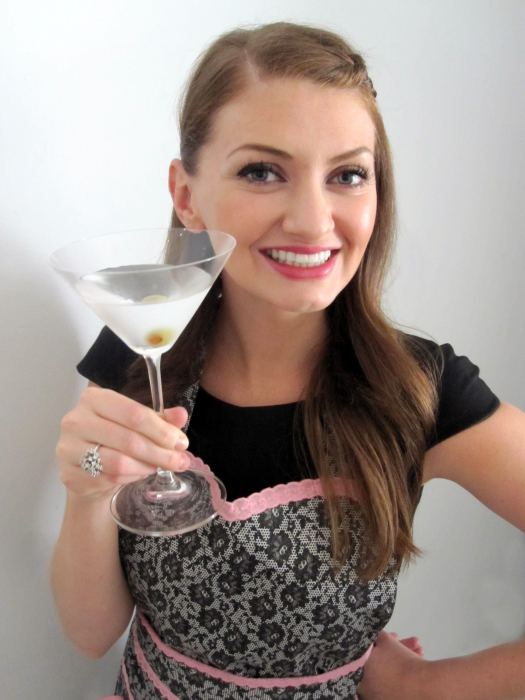 =) You’ve gotta give these a try – I think you’ll love them! In large bowl (or in your stand mixer, fitted with the paddle attachment), beat butter, sugar, eggs, and vanilla until light and fluffy. In a separate bowl, whisk together the flour, cocoa, baking soda, and salt; add the flour mixture to the butter mixture in two separate additions, beating well after each addition, until well-blended. Mix in the caramel bits and chocolate chips, stir until combined. Drop by rounded heaping tablespoonfuls onto greased (or parchment paper or Silpat-lined) cookie sheets. Press each cookie down slightly to flatten, then sprinkle with a pinch of sea salt. Bake for 8 to 10 minutes, or just until set. Cool for about 10 minutes on the cookie sheet(s) before transferring to wire racks to cool completely. these look goregous and so yummy, amy! i’m not a big salted dessert fan but i’d make an exception for these cookies. Chocolate + Caramel = Can I have this for lunch? These look amazing. Pinning immediately! Nothing wrong with firing up the oven in the summer if these beauties are the result! I will never tire of salted caramel. Plus chocolate? Yes, please! Oh my, chocolate and caramel. You’ve got me. These sound so good. I think cookies are my “Desert Island Dessert.” I just love them, and these are a must do. Thanks! These look amazing Amy, love the salted caramel!! Well don’t these look and sound amazing! I love love LOVE the combo of salty and sweet! It is such a win… salted chocolate w. caramel =the best combo ever! LOVE it! I love caramel in cookies and surprisingly I have never tried making my own!! These look so good that I might end up making them tonight!! These look incredible! I’m always in the search for a good chocolate cookie, so I’m definitely trying these very soon. I will love cookies for-EVA. And salted caramel has really hung on too, for good reason! Love these, Amy! I would love 1 or 2, make that 3 or 4 of these cookies right now! They look delicious! Literally this is everything I could ever want in a cookie! Salted caramel? Chocolate? Oh yea!! Chocolate and caramel sound divine and so tempting. phew, so relieved to see already-made caramels in this recipe because they look delicious, but I ain’t makin’ caramel. Mmm I just made salted chocolate cookies with peanut butter chips. I now wish I had used caramel bits! I’ve wanted to make these from day one the recipe was posted. This afternoon my granddaughter and I decided we could wait no longer. All I can say is this recipe is an absolute keeper. The entire family could not wait for them to come out of the oven. I am SO thrilled to hear that, Sue! And how fun that you and your granddaughter made them together. Family baking is absolutely the best type of baking. =) Cheers! Previous post: Fearless Baby Update!